The Bart Bernard Injury Lawyers is seasoned with decades of experience bringing legal claims for whiplash injury to a successful conclusion for our clients. If you are in pain, have accrued significant medical, chiropractor, or physical therapy bills, have suffered a loss of wages, or are in emotional pain, we can help at our offices in Baton Rouge and Lafayette. A whiplash injury can happen if a person’s neck and spine move back and forth very rapidly, especially if they are in an enclosed space. People call it “whiplash” because the movement is similar to what occurs when a whip cracks back and forth. A whiplash injury can happen whenever you are shaken back and forth. It is most frequent in vehicle collisions, especially if you have been rear-ended. It’s important to note, though, that whiplash injuries can also happen in abuse cases, such as infants being shaken back and forth. They can also happen in sports injuries, if a player is shaken back and forth by direct contact. 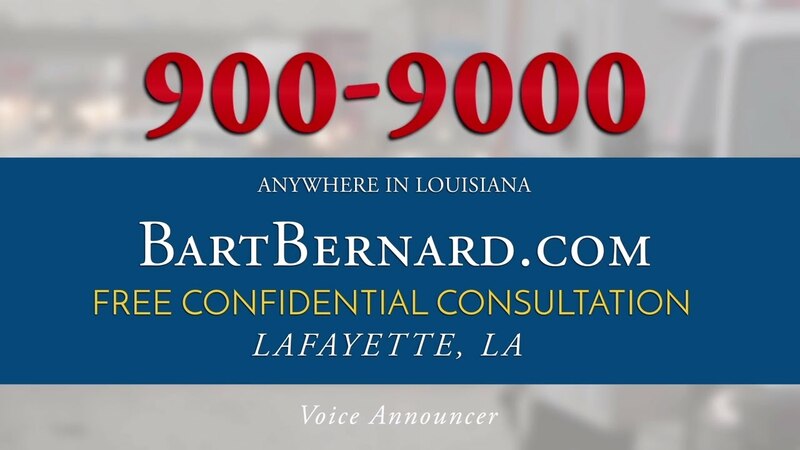 If you or a loved one are suffering from a whiplash injury in Louisiana, the Bart Bernard Injury Lawyers offers our sincere sympathies. It’s common to consider whiplash a relatively minor injury. But victims of serious whiplash injuries know that the effects can be very serious. Whiplash can be the source of chronic pain. It can make movement difficult or impossible. Physical pain and mobility issues aren’t all. The effects can necessitate taking time off work to see a lengthy series of doctors, chiropractors, and physical therapists. If you’re off work, you lose wages. You may be piling up medical bills. You might be experiencing emotional pain. Sometimes, whiplash injuries render people unable to perform their former job duties or normal activities of daily living. If the incident that caused your injury was caused by another party’s negligence, you may be entitled to substantial monetary damages. Whiplash from a car accident is one of the most common injuries in collisions. Many people suffer neck injury from a car accident. The symptoms may appear quickly, almost right after the accident. But many people with whiplash don’t feel their symptoms until 1 to 2 days after the accident occurred. Some whiplash injuries can be treated satisfactorily, with medication and therapy. Others may result in chronic pain. Whiplash injuries cause many symptoms. Because they result from the body or parts of it moving quickly back and forth, the affected areas can be the head, the neck, or throughout the body. Both hard tissues and soft tissues can be injured, damaged, or bruised. The neck or other areas can be sprained. Whiplash sufferers may get headaches, be stiff, or have pain in their neck, shoulders, arms, and upper back. People may have neck or back pain constantly or only when they move the affected part. They may not be able to move their necks or backs as they did before the whiplash. Numbness, fatigue, and dizziness after an accident can also be signs of whiplash. Some people with whiplash may have ringing in the ears (tinnitus) or vision difficulties. You may have a hard time sleeping, problems with concentration, or get irritated easily. Some people become depressed and have memory problems. If you have experienced any of these symptoms, it’s important to see a doctor or go to the emergency room. Diagnosis of whiplash can be challenging because the number of possible symptoms and potential injuries is wide. You need to speak to medical personnel as soon as possible after any accident that might have caused whiplash. How Much Is My Whiplash Injury Worth? Sufferers from whiplash injuries in a car accident or any other type of accident can bring legal claims to get financial compensation for medical bills, physical therapy, medications, and other bills related to treatment. If you have to take time off work, you can receive compensation for the loss of wages and any lost benefits (like vacation days). You can be compensated for pain and suffering. If you won’t be able to perform the same work tasks you once did, you can file a whiplash compensation claim for retraining or disability. Figuring out what a whiplash injury is worth is complex. It’s a good idea to consult professionals, such as lawyers experienced in assessing these kinds of cases and negotiating whiplash settlements. Compensation for medical and related bills is usually figured by adding up the relevant bills for treatment: doctor’s visits, emergency room visits, medication, surgeries, physical therapy, and anything related. Courts usually value pain and suffering based on a scale and compensate according to it. Have you or a loved one been in an accident that caused whiplash? These cases can be complicated. You need a lawyer experienced in whiplash compensation. At Bart Bernard, we handle your whiplash injury case with the utmost care and concern. We are experienced in whiplash from car accidents and other causes. Our initial consultation on your case is free. Call our personal injury law offices in Lafayette or Baton Rouge, or contact me online today.